A review of Eisenhower's use of intelligence resources and covert operations--first as Supreme Allied Commander in World War II, then as president--which, though variously flawed, does demonstrate a vital linkage between the two: because of his wartime experience, Ike was ready and willing, come the Cold War, to apply covert action by the CIA to any international problem, especially in the Third World. 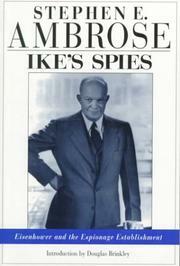 Ambrose, an old Eisenhower hand, and Immerman, a CIA specialist, present Ike as the epitome of the managerial general in his direction of the myriad wartime intelligence activities. His first exposure to covert action occurred when the OSS tried unsuccessfully to woo the Vichy French to passivity prior to the North African invasion. He learned the dangers of overreliance on ULTRA intercepts when his intelligence head failed to foresee Rommel's offensive at Kasserine Pass. Then, with D-Day in prospect, he managed the elaborate deception that cloaked the true invasion site. And, the authors write, he used ULTRA preeminently for early warning of Hitler's planned attack at Mortain to choke the Allied breakout from the Normandy beachhead. Somewhat more dubious, in the light of new evidence, is their contention that the failure of the Arnhem operation "indicated that the Allies had come to rely too heavily on ULTRA." In other instances, too, their interpretation of intelligence failures involving ULTRA is open to challenge. But on the whole their account of Ike's relationship to wartime intelligence is adequate if no breakthrough--except for its bearing on his enthusiasm, as president, for the early CIA of Allen Dulles. Apropos of those years, however, they merely describe--with little new information--familiar covert operations in Iran, Guatemala, Indonesia, and Cuba; they ignore the use of the CIA in the Middle East (in Egypt, Syria, and Iraq); and they obscure the extensive CIA involvement in the Congo by concentrating on whether or not Ike ordered the assassination of Patrice Lumumba (in apparent ignorance, moreover, of the admitted CIA role). Finally, the continuity of CIA programs from the Truman to the Eisenhower administrations is barely explored--leaving the reader with a faulty impression of Ike's particular input. While the WW II section will serve for some purposes, the treatment of the presidential years is apologetic in tone and verges on palace, not critical, history.